SQLite includes a powerful mechanism for enabling full-text search against SQLite records. 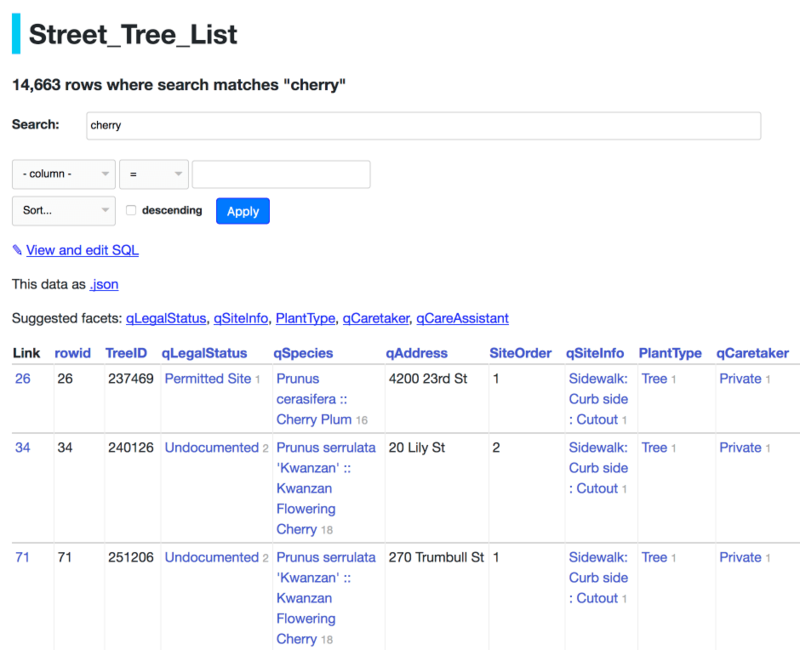 Datasette can detect if a table has had full-text search configured for it in the underlying database and display a search interface for filtering that table. Datasette detects which tables have been configured for full-text search when it first inspects the database on startup (or via the datasette inspect command). You can visit the /-/inspect page on your Datasette instance to see the results of this inspection. Tables that have been configured for full-text search will have their fts_table property set to the name of another table (tables without full-text search will have this property set to null). There are three different versions of the SQLite FTS module: FTS3, FTS4 and FTS5. You can tell which versions are supported by your instance of Datasette by checking the /-/versions page. FTS5 is the most advanced module but may not be available in the SQLite version that is bundled with your Python installation. Most importantly, FTS5 is the only version that has the ability to order by search relevance without needing extra code. If you can’t be sure that FTS5 will be available, you should use FTS4. Datasette takes advantage of the external content mechanism in SQLite, which allows a full-text search virtual table to be associated with the contents of another SQLite table. This creates a set of tables to power full-text search against items. The new items_fts table will be detected by Datasette as the fts_table for the items table. You can use this technique to populate the full-text search index from any combination of tables and joins that makes sense for your project. If a table has a corresponding FTS table set up using the content= argument to CREATE VIRTUAL TABLE shown above, Datasette will detect it automatically and add a search interface to the table page for that table. You can also manually configure which table should be used for full-text search using querystring parameters or Metadata. You can set the associated FTS table for a specific table and you can also set one for a view - if you do that, the page for that SQL view will offer a search option. The fts_table metadata property can be used to specify an associated FTS table. If the primary key column in your table which was used to populate the FTS table is something other than rowid, you can specify the column to use with the fts_pk property. Table views that support full-text search can be queried using the ?_search=TERMS querystring parameter. This will run the search against content from all of the columns that have been included in the index. This will return all records containing at least one word that starts with the letters rob. You can include full-text search results in custom SQL queries. The general pattern with SQLite search is to run the search as a sub-select that returns rowid values, then include those rowids in another part of the query.